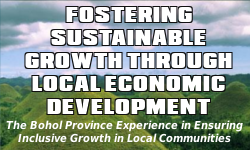 The Provincial Government of Bohol is providing a conducive atmosphere for investment in the province. The Bohol Investment Code has been passed which establishes both fiscal and non-fiscal incentives, and investment mechanism that are investor-friendly. Special assistance services from the government will also be extended in its eco-zones. Investment inflows are foreseen in Bohol in the area of tourism and manufacturing ventures, which can serve as possible venues for future investment with the province. A tourism enterprise zone is proposed to be established in Bohol. Preferred investment in Bohol are the setting up of the theme parks of golf courses and the development of nature and mountain resort for tourism that will generate investment in areas that will enhance Bohol’s natural attractions; accommodation facilities, restaurants and food outlets, transportation services that will cater mostly to tourist and other tourism-related services.